Do you look for signs that make decision making easier? Not the life altering, self improvement or parenting type of signs but the fun decorating-your-house kind of signs that motivate one to make changes. Recently, Mary Ann, author of the inspiring Classic Casual Home blog wrote about Woodyliana's beautiful pillows and proper pillow care (here). I had a set of Liana's Lee Jofa pillows favorited in my Etsy account. I spotted them in Mary Ann's post and that was the sign! They are now sitting on the sofa in my husband's tv room (formerly the unused living room). I also love this Thomas O'Brien Nympheus pillow that Liana makes but cannot find the right place for it. I think it is stunning! 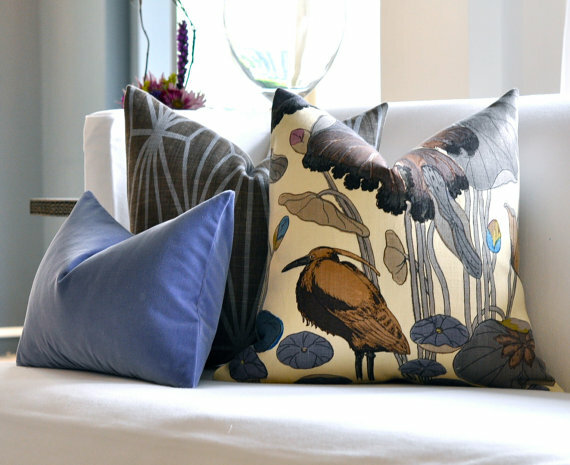 Shop Liana's pillows here. Visit Mary Ann at Casual Classic Home here. HOW CAN I BE SO JEALOUS...and still want to give you a hug? I still want that pillow. It's even prettier in person, isn't it? PS. Looks awesome with the wall colors.